We wouldn’t risk our engine on sub-par parts. Would you? Think outside the OEM for premium parts at a not-so-premium price. HHP only sells aftermarket parts that are manufactured using top of the line machining to ensure each part is manufactured to OEM specifications. Combine this with up to 50% off OEM prices, an industry leading warranty and technical expertise from HHP’s certified staff, and you’ve got a quality part that will keep you running for another million miles. Need a little extra proof? Let’s talk shop. Easy Ordering, Faster Delivery. When a machine breaks down, time is of the essence. We’ve got you covered, with delivery in 2-days or less of in-stock parts to most areas. Quality You Can Count On. We source our aftermarket parts from manufacturers that are actively involved in the research and development of new equipment in the Heavy Duty Industry. From production to delivery, our manufacturer strives for perfection. Human Involvement. In today’s age of technology, how many companies can say their products are hand-inspected to ensure the part is not only free of defects, but is built to last. We can, but our competitors can’t. In fact, each and every part is inspected throughout the manufacturing process by top-notch technicians whose top-priority is quality. 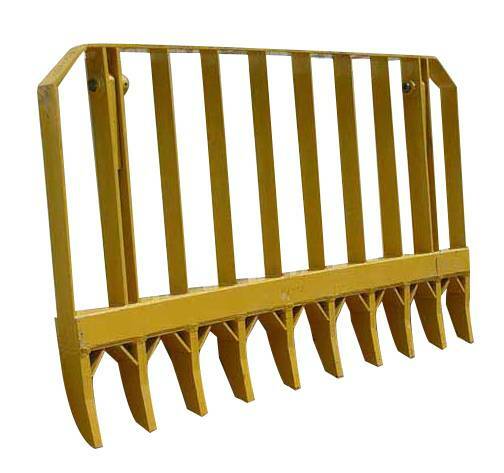 The root rakes can be fit onto many dozer models. For correct size recommendation, customers dozer model and blade width is necessary.